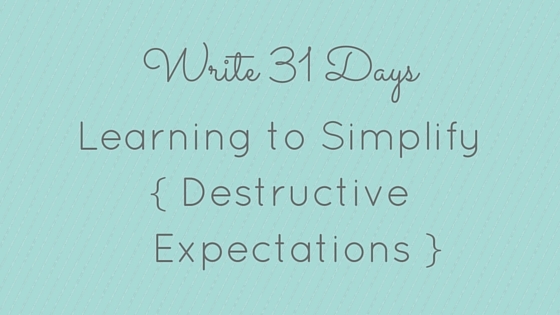 After just completely missing yesterday in the #write31days challenge, I’m back. Sorry ’bout that. All too often, I expect too much from the people in my life. Because of my unrealistic expectations, I set them up for failure. This is detrimental to the relationship — it can cultivate dissatisfaction, resentment, defeat, hurt feelings, and most definitely disappointment. When what I want is perfection, I should anticipate shortcomings. Not because people want to let me down, but because people are people. Just broken people in a broken world. Naturally, for myself, I want fair standards. I want grace and compassion extended to me. So, why am I hesitant to offer this same grace to others? 1. What do I know to be true? As I evaluate a scenario that’s left me feeling hurt, I ask myself what do I know to be true of that person and my relationship with them: Are their intentions bad? Do they love me? Would they ever purposely let me down? When I consider the facts instead of just my feelings, I can see more clearly. And, 2. Who is my hope really in? Only the Lord. Everyone else will fail me at some point. But there is only one who is always faithful and always trustworthy because He knows no other way. Lets learn to let others, and ourselves, off the hook. Grant abundant grace. And let’s tuck our hope away in the proper holding place that’s safe from all the let downs this world has to offer, in Christ alone.